in Japan revive in swift succession with almost painful acuteness. coasts;--and visions of desolate little graves marked only by threads of blue smoke ascending,--graves of pet animals or birds remembered by simple hearts in the hour of prayer to Amida, the Lord of Immeasurable Light. Smoulders my life away, consumed by the pain of longing!
. . . The merest outline of the subject is terrifying! I shall attempt nothing more than a few notes about the religious, the luxurious, and the ghostly uses of incense. incense which can be said to bear an important relation to the religious service. "Incense," declares the Soshi-Ryahu, "Is the Messenger of Earnest Desire. When the rich Sudatta wished to invite the Buddha to a repast, he made use of incense. He was wont to ascend to the roof of his house on the eve of the day of the entertainment, and to remain standing there all night, holding a censer of precious incense. And as often as he did thus, the Buddha never failed to come on the following day at the exact time desired." [1. "Short [or Epitomized] History of Priests." 2. "The Praise of Pious Observances." that so may I do homage to all the Buddhas in the Ten Directions of the Past, the Present, and the Future!" "In the burning of incense we see that so long as any incense remains, so long does the burning continue, and the smoke mount skyward. Now the breath of this body of ours,--this impermanent combination of Earth, Water, Air, and Fire,--is like that smoke. And the changing of the incense into cold ashes when the flame expires is an emblem of the changing of our bodies into ashes when our funeral pyres have burnt themselves out." perfume of earthly incense:--"In the Thirty-Second Vow for the Attainment of the Paradise of Wondrous Incense," he says, "it is written:--'That Paradise is formed of hundreds of thousands of different kinds of incense, and of substances incalculably precious;--the beauty of it incomparably exceeds anything in the heavens or in the sphere of man;--the fragrance of it perfumes all the worlds of the Ten Directions of Space; and all who perceive that odor practise Buddha-deeds.' In ancient times there were men of superior wisdom and virtue who, by reason of their vow, obtained perception of the odor; but we, who are born with inferior wisdom and virtue in these later days, cannot obtain such perception. Nevertheless it will be well for us, when we smell the incense kindled before the image of Amida, to imagine that its odor is the wonderful fragrance of Paradise, and to repeat the Nembutsu in gratitude for the mercy of the Buddha." (cha-no-yu or cha-no-é), and the etiquette of incense-parties (kô-kwai or kô-é). Incense-parties were invented before the time of the Ashikaga shôguns, and were most in vogue during the peaceful period of the Tokugawa rule. With the fall of the shôgunate they went out of fashion; but recently they have been to some extent revived. It is not likely, however, that they will again become really fashionable in the old sense,--partly because they represented rare forms of social refinement that never can be revived, and partly because of their costliness. the contest depends upon the ability to remember and to name different kinds of incense by the perfume alone. 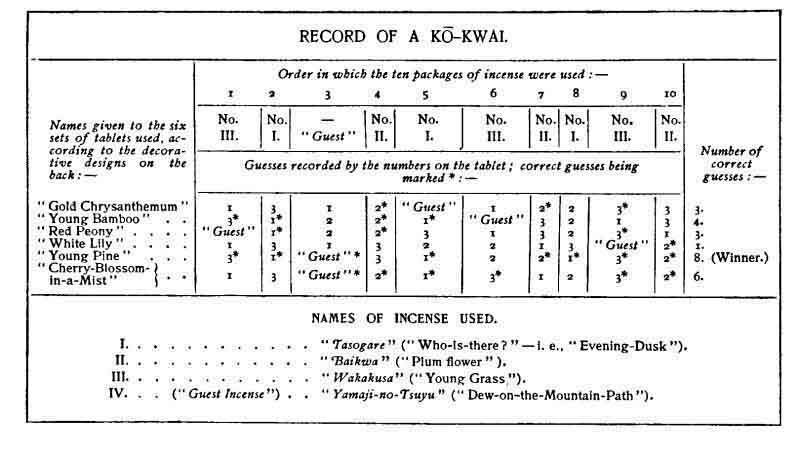 That variety of kô-kwai called Jitchû-kô ("ten-burning-incense") is generally conceded to be the most amusing; and I shall try to tell you how it is played. of the Chinese character signifying "guest." Accordingly we have a total of thirteen packages to start with; but three are to be used in the preliminary sampling, or "experimenting"--as the Japanese term it,--after the following manner. the fourth,--and so on. When the censer has gone the round of the party, it is returned to the incense-burner. One package of incense No. 2, and one of No. 3, are similarly prepared, announced, and tested. But with the "guest-incense" no experiment is made. The player should be able to remember the different odors of the incenses tested; and he is expected to identify the guest-incense at the proper time merely by the unfamiliar quality of its fragrance. before the first player; and all is ready for the real game. The incense-burner retires behind a little screen, shuffles the flat packages like so many cards, takes the uppermost, prepares its contents in the censer, and then, returning to the party, sends the censer upon its round. This time, of course, he does not announce what kind of incense he has used. As the censer passes from hand to hand, each player, after inhaling the fume, puts into the tablet-box one tablet bearing that mark or number which he supposes to be the mark or number of the incense he has smelled. If, for example, he thinks the incense to be "guest-incense," he drops into the box that one of his tablets marked with the ideograph meaning "guest;" or if he believes that he has inhaled the perfume of No. 2, he puts into the box a tablet numbered "2." When the round is over, tablet-box and censer are both returned to the incense-burner. He takes the six tablets out of the box, and wraps them up in the paper which contained the incense guessed about. The tablets themselves keep the personal as well as the general record,--since each player remembers the particular design upon his own set. The remaining nine packages of incense are consumed and judged in the same way, according to the chance order in which the shuffling has placed them. When all the incense has been used, the tablets are taken out of their wrappings, the record is officially put into writing, and the victor of the day is announced. I here offer the translation of such a record: it will serve to explain, almost at a glance, all the complications of the game. According to this record the player who used the tablets decorated with the design called "Young Pine," made but two mistakes; while the holder of the "White-Lily" set made only one correct guess. But it is quite a feat to make ten correct judgments in succession. The olfactory nerves are apt to become somewhat numbed long before the game is concluded; and therefore it is customary during the Kô-kwai to rinse the mouth at intervals with pure vinegar, by which operation the sensitivity is partially restored. custom in some families to enter all such records in a book especially made for the purpose, and furnished with an index which enables the Kô-kwai player to refer immediately to any interesting fact belonging to the history of any past game. ancient Japanese temples also include such foreign incense among their treasures. And very rarely a little of this priceless material is contributed to an incense-party,--much as in Europe, on very extraordinary occasions, some banquet is glorified by the production of a wine several hundred years old. Like the tea-ceremonies, the Kô-kwai exact observance of a very complex and ancient etiquette. But this subject could interest few readers; and I shall only mention some of the rules regarding preparations and precautions. First of all, it is required that the person invited to an incense-party shall attend the same in as odorless a condition as possible: a lady, for instance, must not use hair-oil, or put on any dress that has been kept in a perfumed chest-of-drawers. Furthermore, the guest should prepare for the contest by taking a prolonged hot bath, and should eat only the lightest and least odorous kind of food before going to the rendezvous. it is forbidden to leave the room during the game, or to open any door or window, or to indulge in needless conversation. Finally I may observe that, while judging the incense, a player is expected to take not less than three inhalations, or more than five. In this economical era, the Kô-kwai takes of necessity a much humbler form than it assumed in the time of the great daimyô, of the princely abbots, and of the military aristocracy. A full set of the utensils required for the game can now be had for about $50.00; but the materials are of the poorest kind. The old-fashioned sets were fantastically expensive. Some were worth thousands of dollars. The incense-burner's desk,--the writing-box, paper-box, tablet-box, etc.,--the various stands or dai,--were of the costliest gold-lacquer;--the pincers and other instruments were of gold, curiously worked;--and the censer--whether of precious metal, bronze, or porcelain,--was always a chef-d'�uvre, designed by some artist of renown. Would I had some to burn, in the nights when I wait alone!" even that of a living person, according to some authorities,--it was only necessary to kindle some of the incense, and to pronounce certain words, while keeping the mind fixed upon the memory of that person. Then, in the smoke of the incense, the remembered face and form would appear. slowly became luminous; and the Emperor recognized the form of his beloved. At first the apparition was faint; but it soon became distinct as a living person, and seemed with each moment to grow more beautiful. The Emperor whispered to the vision, but received no answer. He called aloud, and the presence made no sign. Then unable to control himself, he approached the censer. But the instant that he touched the smoke, the phantom trembled and vanished. Japanese artists are still occasionally inspired by the legends of the Hangon-kô. 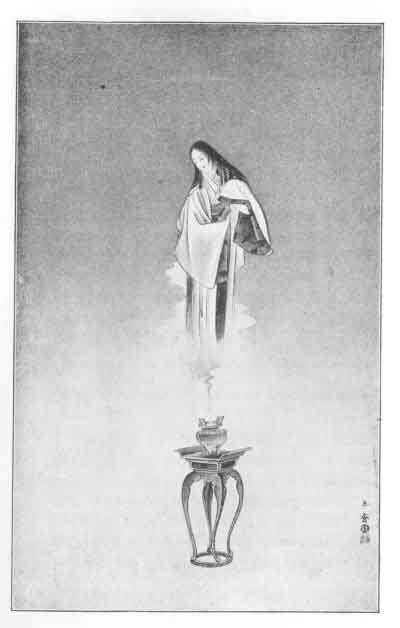 Only last year, in Tôkyô, at an exhibition of new kakemono, I saw a picture of a young wife kneeling before an alcove wherein the smoke of the magical incense was shaping the shadow of the absent husband. of incense only, the burning of any kind of incense is supposed to summon viewless spirits in multitude. These come to devour the smoke. They are called Jiki-kô-ki, or "incense-eating goblins;" and they belong to the fourteenth of the thirty-six classes of Gaki (prêtas) recognized by Japanese Buddhism. They are the ghosts of men who anciently, for the sake of gain, made or sold bad incense; and by the evil karma of that action they now find themselves in the state of hunger-suffering spirits, and compelled to seek their only food in the smoke of incense.